I spent a couple of hours this morning humming along in the kitchen, making soup and baking a cake for a friend who is recovering from surgery. Now, there are SO MANY recipes for both soup and cake that I have tried and loved. But I have this hopeless and maddening addiction to trying new recipes (searching for some hypothetical "perfect" recipe...I don't know), and sure enough, I found new ones to try this morning. I wanted to use a nourishing vegetable such as spinach for the soup, and wanted something smooth and creamy in texture, and this recipe from Mark Bittman's blog looked perfectly simple and delicious. I was curious to see how green onions would work in the recipe. The only modification I made was to reduce the proportion of cream, add some flavorful parmesan and finish the soup with some bright lemon juice which did SO much to bring the flavors together. Adapted from Mark Bittman's recipe, makes a BIG pot (10 servings or so), easily halved. 2 bunches coarsely chopped green onions. Bring the mixture to a boil then simmer for 10 minutes or until vegetables are tender. Blend the mixture in the pot using a stick blender (or wait for it to cool and blend using a regular blender). juice of ½ lemon. Reheat and serve. For the cake, I chose one of my own childhood favorites- marbled cake, with random swirls of chocolate and vanilla running through the loaf. I used this recipe from Martha Stewart. That page has a little video showing this cake being made, and the interesting bit is that the baker, John Baricelli, demonstrates how to get beautiful swirls in the cake by running a skewer through it (the swirling but is about halfway through the 9 minute video). I tried his swirling method but I'm giving away the cake intact so I really won't know how well it worked. That only means I'll have to make another one soon, strictly for research purposes! Have a great weekend, everyone. We're going on a mini-hike tomorrow and we're supposed to have perfect weather (you better be right, meteorologists!) so I am excited. I love pureed spinach!! - will try making this soup tonight- can I use milk instead of the cream, do you think? I LOVE my stick blender too- I have no idea how I survived without it(I got it very recently)- It makes cooking such a breeze. I spent the weekend before last making only soups- butternut squash soup, carrot and sweet potato soup..lol.Fun!! MMM perfect for weather .. wish to have both .. If you don't already have 'How to cook everything vegetarian' by Mark Bitmann, I highly recommend it. Most recipes he blogs about are in there. It is my current go-to-book in the kitchen. Hey I am also craving for some nice hot soup from morning!! I am going in kitchen to make it!! i love both the recipes...i am surely making the spinach soup soon..with a lil changes of-course :D..so hard for me not to ;)...btw. you are such a kind friend. And enjoy the hike...i have been thinking of going for one too...perhaps on Sunday, the weather is supposedly nice! Beautifully packed! I love spinach in soups. Beautifully packed and presented. both the soup and the cake. Agree, the stick blender is the best! Sounds heavenly. What a wonderful friend you are, Nupur! Hope the weather gods cooperate and that you have an enjoyable hike. Is Dale coming along? Somehow, I don't see him as the hiking kind, but I could be all wrong! Two wonderful recipes, though I'm partial to the soup. It seems like a lot of water for that amount of spinach, and since I love the taste of spinach, I might add a bit more. And yes, please do some research on the marble cake (and show us the results)! 'Soul warming' stuff - soup and cake from an angel friend when one's spirits are low and into recuperation... You are really an angel..
btw, what have you packed for your hike?? I love how you've packaged the goodies! very cute! I bet it made your friend very happy.. I have never tried spinach soup, but your recipe makes me try it out. Your friend will have a speedy recovery after receiving these heart warming gifts. You are such a loving person, Nupur! You are a good friend, Nupur. Lavanya- I think milk should work, but be careful while adding the lemon juice so that the milk does not split. I love the stick blender for sauces (eg. to make a smooth pasta sauce), smoothies, soups, and I also use it for curries once in a while. Pavithra- Yes, they are perfect for cool weather. Mekhala Nag- I own his "How to Cook Everything" and when I bought it, the vegetarian version had not come out yet. Chakhlere-If you tried it, did you like it? Sharmila- Nutmeg and spinach are a classic combination and go together very well! Rajitha- We have cool(!) weather here this weekend so it is very exciting. 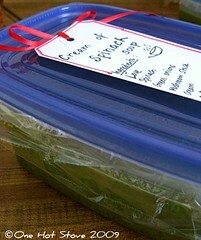 Divya Vikram- Me too...love spinach in soups! Kalyn- Good to know that you like using the stick blender too! Kamini- We had a lovely little hike, and Dale LOVES to hike, so he had a wonderful time :) I'll post a picture next week. Lydia- You could definitely reduce the amount of water or increase the amount of spinach. It was delicious! Arati- For the hike I took along some of the pesto pasta salad, sandwiches stuffed with smashed chickpeas and vegan chocolate walnut muffins. veggiebelly- I do hope she enjoyed it! Namita- This recipe is simple and so delicious, I hope you try it sometime! 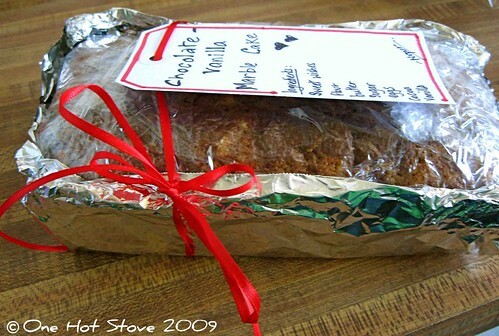 Cynthia- It is fun to make food gifts! You are such a thoughtful friend to make and gift such wonderful things! Hope your friend is recovering nicely. The soup sounds very nourishing and healthy! Will try it. Hope your friend recovers soon. Linda- Immersion blender is a better term than "stick blender" :D and yes, I hope mine lasts a few more years!! Smita- It is nourishing and also very tasty! The soup looks real simple. will surely give it a try!! What is it about cakes that you eat at home or at someone else's home which makes them so special! I tried one of my favourites too (and posted last week) - a divine chocolate cake my dear friend from Chennai makes...heaven! That soup looks like it could make a really nice meal by itself! Miri- I know, homemade cakes are just irresistible, especially when someone makes their "specialty" that they have made a hundred times and get really good at. I'm off to check out your chocolate cake.